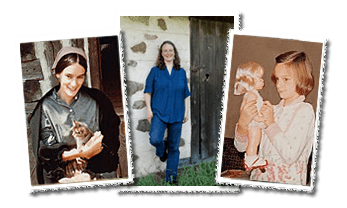 "Multiple red herrings interspersed throughout the story keep readers guessing... and the “Looking Back” section fills in some details on life during the end of World War II." 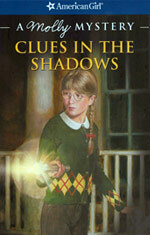 Clues In The Shadows is Kathleen's eighth mystery for American Girl, and her fifteenth published book. 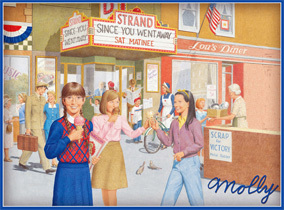 It is written for readers age 9 and up who enjoy stories about Molly McIntire and growing up in American during World War II. Molly still does her her patriotic duty to help America win World War Two, but in the spring of 1945 she's weary and troubled. Dad is home safe . . . but he seems different now. Her favorite Red Cross leader abruptly quits. Her archrival, Ronnie Vanko, is driving her crazy. And now someone is sneaking into the backyard shed and messing with the scrap she's collecting for the latest wartime drive. Who is the intruder: Ronnie, her own brother Ricky—or a prowler she spied in the night? This book includes a richly illustrated "Peak Into The Past" essay. Clues In The Shadows was published as a 192-page book in softcover, hardcover (library binding) and in multiple eBook formats. "When General Eisenhower's Waste Paper Collection program is announced, Molly is determined to collect the necessary one thousand pounds of paper so that she can receive the special medal. She stores the collected paper in a shed in her backyard and is distressed to find that someone has been going through the piles. She suspects that her brother or the neighbor boy are stealing it for their own collections. Or could the scary stranger she saw in town be responsible? While solving the mystery, Molly learns the effects war can have on the soldiers and on those waiting at home. When she discovers the person responsible for her missing paper, she also learns how past secrets can haunt people and cause them to be fearful. Young readers will enjoy Molly's adventures and will also learn valuable lessons about the effect of World War II on average Americans at home." 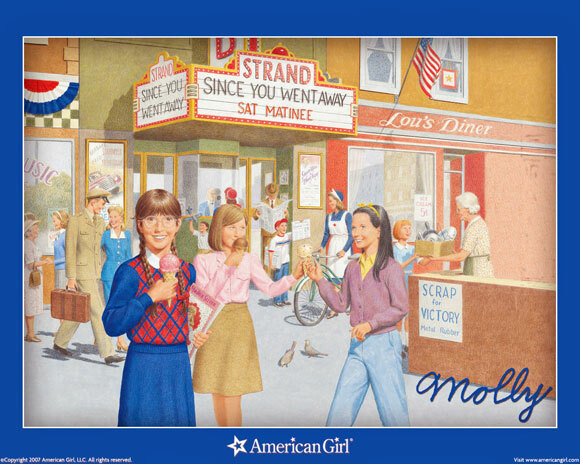 American Girl has "archived" the Molly doll and accessories, which means they are no longer selling them. However, this Molly story is still available as an ebook from the vendors listed below. NOTE: You can buy 'as new' softcover and hardcover copies of Clues In The Shadows and my other American Girl books (signed and personalized as desired) directly from me. To request a quote, click HERE. This book was special to write because I was able to talk to people who’d lived through World War II. I heard stories from my parents, and from some of my husband’s relatives, and from others who’d served in the military or kept things going on the homefront. It was also moving to read about all the things children did to help the war effort. I hope in some small way that Clues in the Shadows pays tribute to everyone who did the best they could in such difficult times.